Some blog posts ago, I reflected on who the First Christian seems to be. I would say that this first Christian is none other than the human being who knew Jesus first and most intimately–His mom. As Catholics, we do not worship Mary but definitely hold her in high regard, just as God Himself holds her in high regard. Just as getting to know Jesus helps us better understand God the Father, getting to know Mary better helps us understand Jesus. I think as Christians, we really miss out on a lot if we disregard Mary and her role in bringing Jesus, quite literally, to us. Exploring that role shows how devoted Mary was to her son. Getting to know some her shows that she wants nothing more than for us to get to know her son more. And she will help us…intercede for us…bring us closer to Him. So, as Christians, we are devoted to Christ–as we should be! From a Catholic perspective, we give Mary honor because she is the greatest creation by God, and she brings us to Christ. Therefore, it is not surprising that Catholics can have a devotion to Mary with the ultimate purpose of being devoted to Jesus. To Jesus through Mary. We are convinced without any doubt that devotion to Our Lady is essentially joined with devotion to Christ, that it assures a firmness of conviction to faith in Him and in His Church, a vital adherence to Him and to His Church which, without devotion to Mary, would be impoverished and compromised. 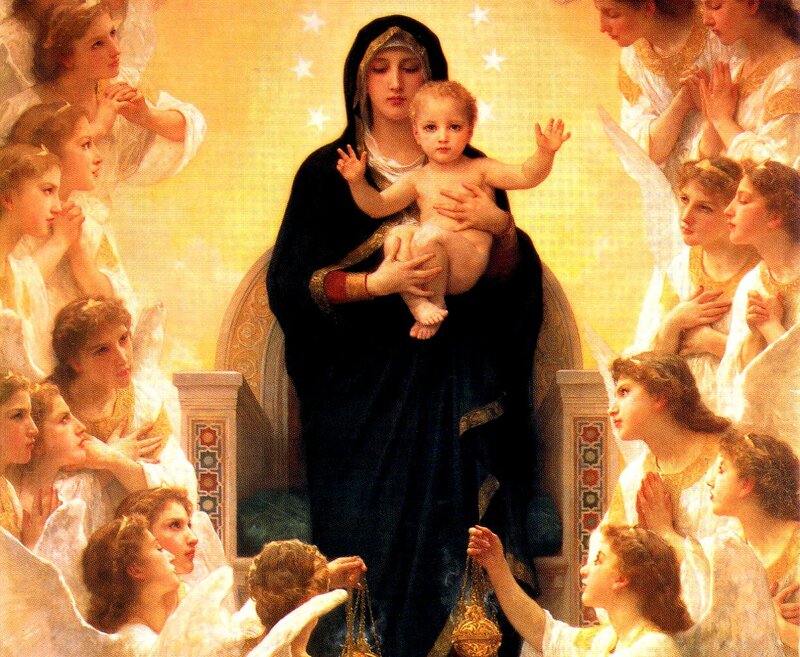 The maternal duty of Mary toward men in no way obscures or diminishes this unique meditation of Christ, but rather shows its powers. All her saving influence on men originates not from some inner necessity, but from the divine pleasure. It flows forth from the superabundance of the merits of Christ, rests on His meditation, depends entirely on it and draws all its power from it. Devotion to Mary, then, ultimately bears fruit in knowing Jesus that much more. And as a Christian, why wouldn’t I desire that? Most people are familiar with the Rosary since it is probably the most recognizable tool in having a devotion to Mary. But most people are probably not aware of its purpose and use in devotion. Long story short, praying the Rosary is asking Mary for her help in meditating through the life of Christ by reflecting on the major milestones of His life recorded in the Gospels. It’s like…prayerfully going through the Gospel without necessarily using a Bible. Yes, Rosary is a big one. But then there’s St. Louis Du Montfort. He was a French priest who lived in the late 1600’s. He went around spreading devotion to the Virgin Mary throughout Europe. This guy absolutely loved Mary and developed spiritual exercises in order to consecrate oneself to Mary as a form of devotion. But his True Devotion to Mary is an intense exercise in spiritual life involving much reflection, emptying oneself of the worldly spirit in order make room to gain knowledge of self, then knowledge of Mary, and thus ultimately knowledge of Christ. He prescribes 33 days at which to devote daily prayer and meditation to consecrate oneself to Mary. You begin by choosing a Marian feast day then counting back 33 days to start the consecration. Why do I even care about this? Well, I think over the past few years, I’ve really developed my Catholic knowledge through religious education, teaching that, and learning apologetics. I’ve always felt lacking in spiritual development, and this is a great opportunity. That’s why it was quite refreshing when I went to on a silent retreat a few months ago. And then I’m mostly motivated to do this consecration since my pilgrimage group for next month’s trip to Rio De Janeiro will all be doing this as well. Actually, I’m starting a little earlier with a friend or two than the rest of my pilgrimage group so that whenever I finish up, it will actually be a feast day (Our Lady of Mt. Carmel) since there are no Marian feast days during our pilgrimage. I’m excited and at the same time nervous…simply because I tend to lack discipline in maintaining a new habit. And then things are crazy right now with work, pilgrimage prep, and everything else I’ve got going on at my parish. But, I think the fruits of going through this devotion will be much needed.